Creating an input control from the Design view prompts you to create a bound parameter on the Parameters tab. Binding a control to a parameter will populate the parameter. You may also add input controls from the New Parameters dialog box that appears when creating a report or graph with parameters. For more information about the New Parameters dialog box, see Automatically Creating Controls From the New Parameters Dialog Box. Except for the Hidden control, the Properties and settings dialog box will display for all controls when in the Design tab and Parameters tab. The Properties and settings dialog box will display for the Hidden control only when in the Parameters tab. A text box enables you to enter a value in a text entry field. A text box only provides a single-select value. Click the Text Box button from the Components toolbar. From the Insert menu, select Controls, then click Text Box. Drag the crosshair to create a text box and adjust it to the size you want. A text box is created in the layout and assigned the name edit(n), where n is a number. Optionally, change the properties of the text box by adjusting the properties displayed in the Properties tab of the Properties window. For details, see Text Box Properties in the Properties Window. Binding a parameter to a text box creates an incoming parameter. An incoming parameter is a parameter that is bound to a control. The parameter value will populate the text box with values. Close this dialog since you are populating the text box with a parameter value. Select the center of the parameter name object, left-click and drag the parameter to the center of the text box object, and release the mouse to complete the binding. To unbind the parameter from the text box, select the arrow head on the line, so that the line is bold, right-click, and select Break binding. If binding a text box to a parameter, the value can only be single select. Binding the text box to a parameter will populate the parameter with the single value. Create the single value for the text box. You can create a single Static or Dynamic value. Close the Properties and settings dialog box to create the text box with the single value. Bind the text box to a parameter. Select the center of the text box, left-click and drag the text box to the center of the parameter object, and release the mouse to complete the binding. When entering a value in a text box at run time, you may set the mask text property so that the text is not displayed as text, but masked by default characters. This is recommended when using passwords or other sensitive information. Select the Text Box object to view the associated properties. You may also select the text box properties from the drop-down list of the Properties window. The properties for the text box appears as edit(n) <INPUT>. From the Mask text property field, select Yes. Run the report and enter a value in the text box. The value being entered appears as masked text, as shown in the following image. When a text box is selected, the Properties tab in the Properties window contains options that control the properties of your text box. A text area is a single-select control that enables you to enter multiple lines of text that can be assigned to a single variable. The behavior is similar to a text box, but you are not restricted to entering just one line of text. For example, if you want to assign a paragraph (multiple lines of text) to a variable that can be referenced by a procedure, you can add the paragraph to a text area from the Properties and settings dialog box on the Parameters tab. Note: When the Multiple property is set for a text area control, you can enter data values separated by semicolons, commas, or carriage returns. The following image shows the text area component in HTML Composer. Click the Text Area button from the Components toolbar. From the Insert menu, select Controls, then click Text Area. Drag the crosshair to create a text area and adjust it to the size you want. A text area is created in the layout and assigned the name textarea(n), where n is a number. Optionally, you can change the properties of the text area in the Properties tab of the Properties window. For details, see Text Area Properties in the Properties Window. Binding a parameter to a text area creates an incoming parameter. An incoming parameter is a parameter that is bound to a control. The parameter value will populate the text area with values. Close this dialog since you are populating the text area with a parameter value. To unbind the parameter from the text area, select the arrow head on the line, so that the line is bold, right-click, and select Break binding. If binding a text area to a parameter, the value can only be single select. You can create one or more lines of text for the single value. Binding the text area to a parameter will populate the parameter with the single value. Create the single value for the text area. You can create a single Static or Dynamic value. Note: If you are creating a Static Data type for the text area, you may enter one or more lines of text by typing or pasting text into the Selected Value input field. Close the Properties and settings dialog box to create the text area with the single value. Bind the text area to a parameter. Select the center of the text area, left-click and drag the text area to the center of the parameter object, and release the mouse to complete the binding. When a text area is selected, the Properties tab in the Properties window contains options that control the properties of your text area. A drop-down list enables you to select a single value from a list of supplied values. You can use a dynamic or static list of values for the drop-down list. Click the Drop Down List button from the Components toolbar. Drag the crosshair to create a drop-down list, and adjust it to the size you want. 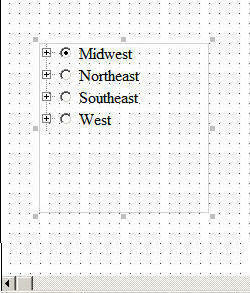 A drop-down list is created in the layout and assigned the name combobox(n), where n is a number. Optionally, change the drop-down list properties by adjusting the properties displayed in the Properties tab of the Properties window. For details, see Drop-Down List Properties in the Properties Window. Close this dialog since you are populating the drop-down list with a parameter value. Select the center of the parameter name object, left-click and drag the parameter to the center of the drop-down list object, and release the mouse to complete the binding. To unbind the parameter from the drop-down list, select the arrow head on the line, so that the line is bold, right-click, and select Break binding. Binding the drop-down list to a parameter will populate the parameter with a list of values. Create the list of values for the drop-down list. You can create a list of Static or Dynamic values. Close the Properties and settings dialog box to create the text box with the list of values. When using a drop-down list input control to supply parameter values, the Multiple property value indicates whether multiple values can be selected from a list of supplied values at run time. Note: A multiselect list enables you to select multiple values by using the Ctrl key while selecting values. In order to select multiple values in the drop-down list, the procedure must be set up to accept multiple values. Ensure that the Variable Type for the parameter value is Multiselect OR or Multiselect AND in the procedure. From HTML Composer, insert a report with parameters that accept multiple values. 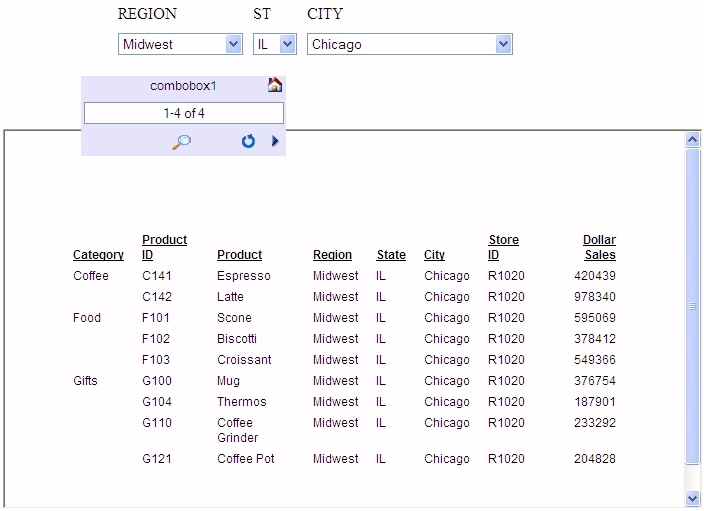 For example, create a report with Multiselect OR as the variable type for the parameter, accepting a dynamic list of values from ggsales, with REGION as the value for returned and displayed fields. When the New Parameters dialog box appears, accept the default control type of Drop down list and click OK. Select Multiple from the Multiple drop-down list in the Properties tab of the Properties window. This indicates that multiple items can be selected from the drop-down list. Select multiple values by using the Ctrl key while selecting values from the drop-down list, as shown in the following image. The drop-down list shows the selected multiple values. 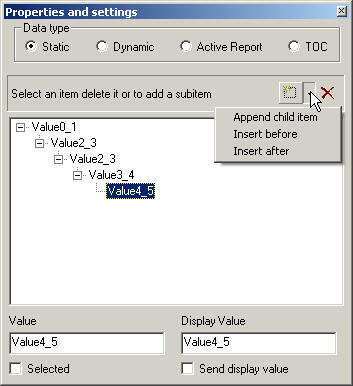 Click the Run button to run the report with the selected value parameters. When a drop-down list is selected, the Properties tab in the Properties window contains options that control the properties of your drop-down list. A single-select list enables you to select only one value for each time a request is run. A multiselect list enables you to select multiple values by using the Ctrl key while selecting values. In order to provide multiple values, the procedure must be set up to accept multiple values. List box values can be dynamic or static. Click the List box button from the Components toolbar. From the Insert menu, select Controls, then click List Box. Drag the crosshair to create a list box, and adjust it to the size you want. A list box is created in the layout and assigned the name listbox(n), where n is a number. Optionally, change the properties of the list box by adjusting the properties displayed in the Properties tab of the Properties window. For details, see List Box Properties in the Properties Window. Close this dialog since you are populating the list box with a parameter value. Select the center of the parameter name object, left-click and drag the parameter to the center of the list box object, and release the mouse to complete the binding. Bind the list box to a parameter. Create the list of values for the list box control. You can create a list of Static or Dynamic values. Close the Properties and settings dialog box to create the list box with the list of values. Bind the list box to a parameter. Select the center of the list box, left-click and drag the list box to the center of the parameter object, and release the mouse to complete the binding. When a list box is selected, the Properties tab in the Properties window contains options that control the properties of the selected list box. When using a list box, you may reorder the selected values in the report. In the Design view of the HTML page, select the list box object, right-click, and select the Add Move Items control. An up and down arrow is added next to the list box control. Select values from the list box and run the report. To reorder the selected values, click the up arrow to move the selected value up in the list box, or click the down arrow to move the selected value down in the list box. Run the report again to view the results with the selected values. 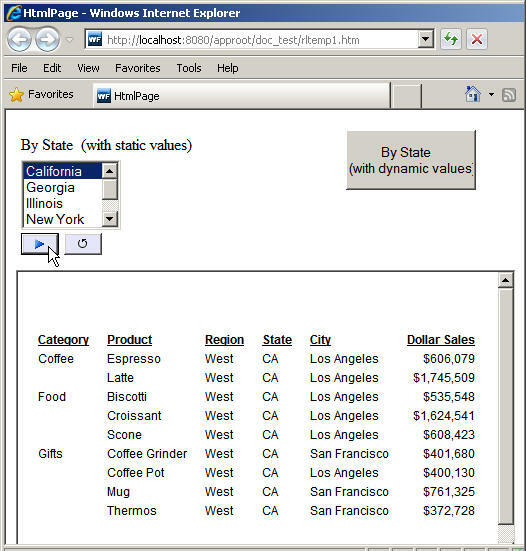 In the following example, CA is the first value in the By State list box. 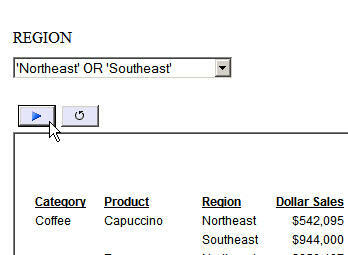 Select the down arrow to reorder the location of CA in the list box and rerun the report again. You may add a double list control for displaying multiselect values. This enables you to view a list of the available values and add or remove them from one list to another. At run time, a report is generated based on the values that are added. Note: When creating a static list of values for a double list control, the add everything value option is not available. From the Components toolbar, click the Double List Control button. From the Insert menu, select Controls, then click Double List Control. Drag the crosshair to create a double list control, and adjust it to the size you want. A double list control is created in the layout and assigned the name customselect(n)_selectfrom and customselect(n)_selectto, where n is a number. You may edit the default description for the double list control by double-clicking Enter text, and typing the description of your choice. Optionally, change the double list control properties by adjusting the properties displayed in the Properties tab of the Properties window. For details, see Double List Box Properties in the Properties Window. Bind an existing parameter to the double list control. Binding a parameter to a double list control creates an incoming parameter. An incoming parameter is a parameter that is bound to a control. The parameter value will populate the double list control with values. If binding a parameter to a double list control, the value can be single or multiselect. Close this dialog since you are populating the double list control with a parameter value. Select the center of the parameter name object, left-click and drag the parameter to the center of the double list control object, and release the mouse to complete the binding. To unbind the parameter from the double list control, select the arrow head on the line, so that the line is bold, right-click, and select Break binding. Bind the double list control to a parameter. Binding the double list control to a parameter will populate the parameter with a list of values. Create the list of values for the double list control. You can create a list of Static or Dynamic values. Close the Properties and settings dialog box to create the double list control with the list of values. Bind the double list control to a parameter. Select the center of the double list control, left-click and drag the double list control to the center of the parameter object, and release the mouse to complete the binding. Note: You can change the default double list control to other types of controls by right-clicking the control object on the Parameters tab or the Design tab and selecting Set Control Type. Run the HTML page and select values by using the right and left arrows to add or remove values to the selected column. The selected values appear in the second column. The output is generated based on the selected values in the second column. In the following example, Action and Comedy are the selected values for the report. Optionally, you may reorder the selected values in the report. The up and down arrows reorder the selected values that appear in the second column of the double list control. Click the up arrow to move the selected value up in the second column of the double list control, or click the down arrow to move the selected value down in the double list control. When a double list box is selected, the Properties tab in the Properties window contains properties of double list controls. Keep Selected Value. When Yes is selected, this option will accumulate values you search for in the right-side box. When you search for another value, the previously searched values will not be deleted. No is selected by default. You may add a paging control to a List Box, Drop Down List, and the first control of a Double List Control, which enables you to page through a large list of values before selecting a value. 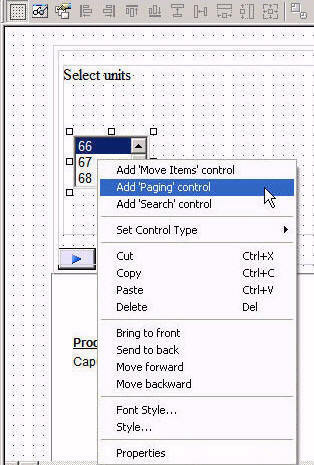 The Add 'Paging' control option is available through the right-click context menu on the Design tab of HTML Composer when an input control is selected. The Add 'Paging' control option enables you to page through a large list of values for a List Box, Drop Down List, and the first control of a Double List Control, before selecting a value. For example, suppose that you have a list box showing 50 values. Adding the paging control enables you to display these values as pages of values, as well as go directly to the first, previous, next, and last pages to select the value. Select the input control on the Design tab of HTML Composer, right-click, and select Add 'Paging' control. Note: The paging control is only valid for a List Box, Drop Down List, and the first control of a Double List Control. The following image shows the Add 'Paging' control option in HTML Composer. The paging control is added below the input control on the canvas, as shown in the following image. Note: If the paging control is not visible, you may need to resize the control and input control objects on the canvas. Optionally, change the Number or Range property for the paging control in the Properties tab of the Properties window. The default Number or Range property is 1-50. 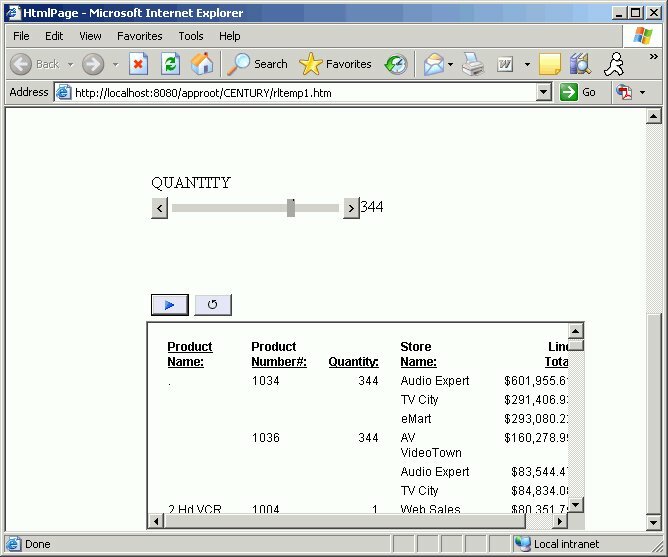 This specifies the number or page range of values to show, per page, for the input control and the starting item number. For example, the input control starts at the first value and displays a range of 50 values per page. Note: The paging control properties are available from the Properties tab of the Properties window when the paging control is selected. The paging control appears as navigator(n) in the Properties window drop-down list. The following image shows the Number or Range property for the paging control in HTML Composer. Use the arrow buttons to page through the values to be displayed for the input control. You may select First, Previous, Next, or Last. Note: You may also type in a page number or range in the paging control at run time, as described in the Number or Range property in step 2. This specifies the number or range of values, per page, for the input control. 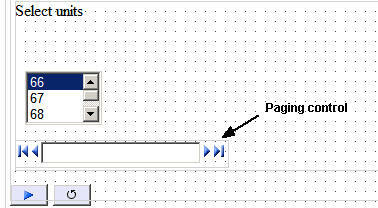 The input control shows the values for the page selected in the paging control. Select a value from the input control. Click the Run button to refresh the report, showing the value selected in the input control. In the following example, the paging control shows 101-200 of 1542. This indicates that there are 99 values available to select from on this page, as shown in the list box. The list box shows the value of 180 as the selected unit. Running the report shows the results with Unit Sales of 180. You may add a search control to a List Box, Drop Down List, and the first control of a Double List Control, which enables you to search for a value in a control, before selecting a value. The Add 'Search' control option is available through the right-click context menu on the Design tab of HTML Composer when an input control is selected. The Add 'Search' control option enables you to search for a value in a control for a List Box, Drop Down List, and the first control of a Double List Control. For example, suppose that you have a list box showing 30 items. Adding the search control adds an additional input field to your output page. Type the value you are looking for and click the search button to find the value in your input control. Select the input control on the Design tab of HTML Composer, right-click, and select Add 'Search' control. Note: The search control is only valid for a List Box, Drop Down List, and the first control of a Double List Control. The following image shows the Add 'Search' control option in HTML Composer. 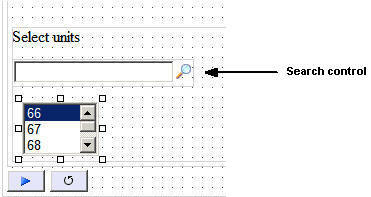 The search control is added above the input control on the canvas, as shown in the following image. Note: If the search control is not visible, you may need to resize the control and input control objects on the canvas. Type the value to be displayed for the input control and click the search button. Pressing the Enter key will not execute the search. You must click the search button. The input control shows a suggested list of matched values. Click the Run button to refresh the report showing the value selected in the input control. In the following example, the search control shows 93 as the search value. This indicates searching the list box records for a value matching 93. The list box shows the value of 93 as the selected unit. Running the report shows the results with Unit Sales of 93. You can use the global search and paging option on the BODY object to have one search and paging control that can be used with each input control on the page. Click the Global search/paging property in the Properties tab of the Properties window for the BODY object, as shown in the following image. Select Yes from the drop-down menu. At run time, the Search/Paging window opens in the Home position, as shown in the following image. When you click an input control, because the Auto-link to selected control option is on by default, the Search/Paging window appears under the input control, as shown in the following image. By default, the window shows all values on one page (for example 1-4 of 4). The label for the input control is displayed showing that it is linked to that input control. If no label is associated with the input control, the window will show the unique identifier for the input control, for example, combobox1. If you want multiple pages, type a range in the Search/Paging field in the format 1-2 of 4, as shown in the following image and press the Enter key. 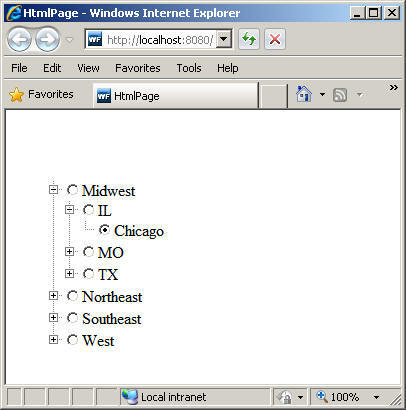 Click the Show settings button on the Global Search and Paging window to expand the window and show the search and paging options, as shown in the following image. Match Case. Search value must match the value in the input control exactly. Match Whole Word Only. Search value word must exist in the string. Auto-link to selected control. Search/Paging window appears under the selected input control. Auto-link is on by default. Keep selected values. This option only affects a double-list. When checked, this option will accumulate values you search for in the right-side box. When you search for another value, the previously searched values will not be deleted. The Global control option overrides individual control options. If Keep selected values is selected for Global searching/paging, that will override whether the double-list has it, regardless of whether it is set for the control itself. You can click the up arrow button on the expanded window to collapse the options. You can click the House icon on the Search/Paging window to move the window back to the Home position. You can use the following buttons on the Search/Paging window to navigate through the pages. First. Shows the first page of values. Previous. Shows the previous page of values. Search. Initiates the search of values based on the text box input. Next. Shows the next page of values. Last. Shows the last page of values. Reset All. Resets the paging back to the original. Show Settings. Expands the Global/Paging window and shows the options. Once expanded, use the button to collapse the settings display. Check boxes enable you to select a single value from a list of supplied values. Note that if there are multiple check box input controls that are grouped together, you may select the Multiple properties for each control. Multiple ensures that you can select a single value from each check box control. Check box list values can be dynamic or static. Click the Check box button from the Components toolbar. From the Insert menu, select Controls, then click Check Box. Drag the crosshair to create a check box list and adjust it to the size you want. A check box is created in the layout and assigned the name checkbox(n), where n is a number. Optionally, change the properties of the check box list by adjusting the properties displayed in the Properties tab of the Properties window. For details, see Check Box Properties in the Properties Window. Bind an existing parameter to the check box. Binding a parameter to a check box creates an incoming parameter. An incoming parameter is a parameter that is bound to a control. The parameter value will populate the check box with values. Close this dialog since you are populating the check box with a parameter value. Select the center of the parameter name object, left-click and drag the parameter to the center of the check box object, and release the mouse to complete the binding. To unbind the parameter from the check box, select the arrow head on the line, so that the line is bold, right-click, and select Break binding. Bind the check box to a parameter. Binding the check box to a parameter will populate the parameter with a list of values. Create the list of values for the check box. You can create a list of Static or Dynamic values. Optionally, select Add display image to display images, in addition to the text next to the check box. You can select the image by clicking the ellipsis button in the Display column of the Properties and settings dialog box. To use dynamic image values, there must be a field in the data source that contains the image file name. The physical image file must exist in the current application if you are working in Local Projects. If you are working in Managed Reporting, the image must reside in the domain Other folder. This field name must be specified as the Display field in the Properties and settings dialog box. If a report on the HTML page is coded to use the User Output format (Parameter name WFFMT), the user can select a check box control from the New Parameters dialog box. The tool will automatically associate the output type image, included with the product, to each check box. Note: For more information on the User Output format, see the Creating Reports With Report Painter manual and the WebFOCUS InfoAssist User’s Manual. Close the Properties and settings dialog box to create the check box with the list of values. Bind the check box to a parameter. Select the center of the check box, left-click and drag the check box to the center of the parameter object, and release the mouse to complete the binding. When a check box is selected, the Properties tab in the Properties window contains properties of the selected check box. Radio buttons enable you to select a single value from a list of supplied values. Radio button values can be static or dynamic. Click the Radio button from the Components toolbar. From the Insert menu, select Controls, then click Radio Button. Drag the crosshair to create a radio buttons list and adjust it to the size you want. A radio button placeholder is created in the layout and assigned the name radio(n), where n is a number. Optionally, change the properties of the radio buttons by adjusting the properties displayed in the Properties tab of the Properties window. For details, see Radio Buttons Properties in the Properties Window. Bind an existing parameter to the radio button. Binding a parameter to a radio button creates an incoming parameter. An incoming parameter is a parameter that is bound to a control. The parameter value will populate the radio button with values. Note: Close this dialog since you are populating the radio button with a parameter value. Select the center of the parameter name object, left-click and drag the parameter to the center of the radio button object, and release the mouse to complete the binding. To unbind the parameter from the radio button, select the arrow head on the line, so that the line is bold, right-click, and select Break binding. Bind the radio button to a parameter. Binding the radio button to a parameter will populate the parameter with a list of values. Create the list of values for the radio button. You can create a list of Static or Dynamic values. Optionally, as shown in the following image, select Add display image to display images in addition to the text next to the radio button. To use dynamic image values, there must be a field in the data source that contains the image file name. The physical image file must exist in the current application if you are working in Local Projects. If you are working in Data Servers, the image must reside in the Current Application folder. If you are working in Managed Reporting, the image must reside in the domain Other folder. This field name must be specified as the Display field in the Properties and settings dialog box. If a report on the HTML page is coded to use the User Output format (Parameter name WFFMT), the user can select a radio button control from the New Parameters dialog box. The tool will automatically associate the output type image included with the product to each radio button, as shown in the following image. Note: For more information on the User Output format, see the Creating Reports With Report Painter manual and the WebFOCUS InfoAssist User’s Manual . Close the Properties and settings dialog box to create the radio button with the list of values. Bind the radio button to a parameter: Select the center of the radio button, left-click and drag the radio button to the center of the parameter object, and release the mouse to complete the binding. When a radio button is selected, the Properties tab in the Properties window contains options that control the properties of your radio buttons. By using a tree structure in an HTML report, you can show hierarchical data from a multidimensional data source (for example, SAP BW), that uses the parent/child model. You may also use a tree control for non-hierarchical data sources. Level hierarchies are not supported. 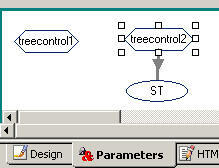 The behavior of the tree control is integrated with the parameter definition. If a parameter is defined as a single value and that parameter is bound to a tree control, the tree control uses option buttons for each node in the hierarchy. If the parameter is defined as Multiselect OR or Multiselect AND, and that parameter is bound to a tree control, then the tree control uses check boxes for each node in the hierarchy, enabling you to select multiple nodes. You can show a tree structure for a non-hierarchical data source by using a tree control. By identifying the number of layers for the tree control, you are able to populate each layer of the tree control with its own procedure. Setting the number of layers creates a tree structure by which each layer is its own subcontrol, chained together with no conditions. This procedure describes how to add parameters for a tree control, where the number of layers property is set. From the Insert menu, select Controls, then click Multi source Tree control. From the Properties tab of the Properties window, type in the Number of layers for the tree control, and press the Enter key. This enables you to specify the number of layers to populate. The following image shows the Number of layers property with three (3) layers. With the tree control selected, click the Parameters tab. The tree control object shows the set number of layers. For example, the following image shows a tree control with three layers on the Parameters tab. Select each layer of the tree control and create the properties and settings for its data population. When creating a Multi source Tree control, the static data type is not available. If creating static values for the tree control, you must create a single source tree control. To create a static list of values, see How to Add a Tree Control to an HTML Page Using Static Values. 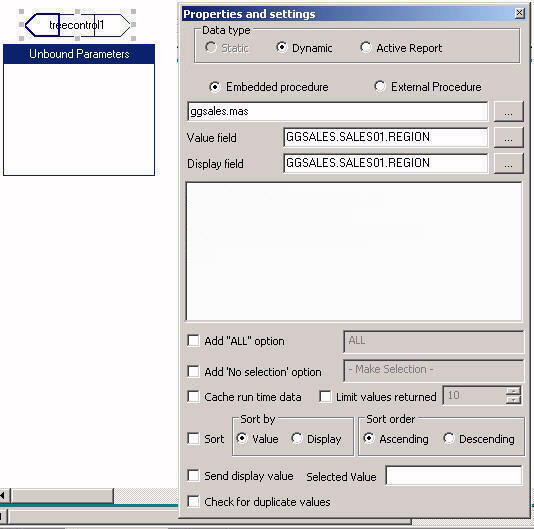 Select the first layer of the tree control and create a dynamic embedded procedure for the REGION field of the GGSALES data source. Select the second layer of the tree control and create a dynamic embedded procedure for the ST field of the GGSALES data source. 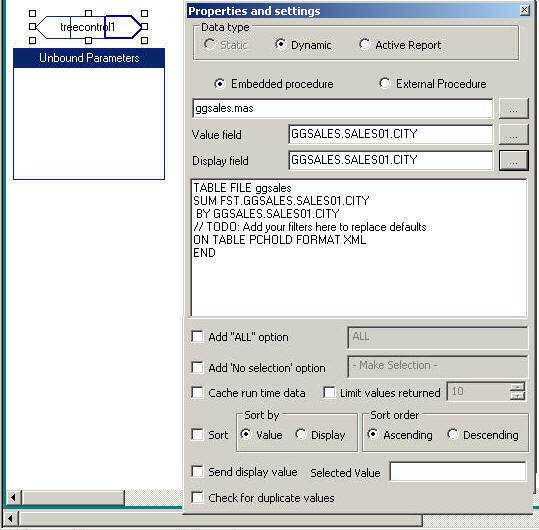 Select the third layer of the tree control and create a dynamic embedded procedure for the CITY field of the GGSALES data source. Optionally, to add an additional layer for the tree control, right-click the tree control object on the Parameters tab and select Add layer. 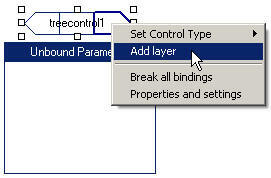 Note: The Add layer option only appears for a Multi source tree control object. Click the added layer to view the properties and settings for that layer. Switch to the Design tab of HTML Composer to preview the populated tree control. Note that the Properties window drop-down list for the tree control shows each layer of input values. Save and run the page. Note: If a user selects a lower level node in one layer and a higher level node in another layer, when the procedure is executed, only the lowest level selections will take effect. For example, you have 3 layers: COUNTRY, CAR, and MODEL. Under ENGLAND, TRIUMPH, you select TR7. Under FRANCE, you select PEUGEOT. At run-time you will only receive the records for TR7 because you did not select a MODEL under the FRANCE node. The tree control populates each layer with values. For example, the following image shows the REGION, ST, and CITY fields as a hierarchy of the GGSALES data source in the tree control. Note: A value must be selected for each layer before you can click the Save Selection button. If a selected value is specified for a field that is not in Layer1, then corresponding selected values must also be specified for the preceding layers. Only the first and second layers load at run time. If a selected value is specified for a field in Layer1, only values from the first two layers will be selected. This procedure describes how to add static data type parameters for a tree control, where the Number of layers property for the tree control is not set. This enables you to add a static list of values. Click Single source Tree control from the Tree control drop-down list, located on the Components toolbar. From the Insert menu, select Controls, then click Single source Tree control. From the Properties and settings dialog box, select Static as the Data type. Static is selected by default. You may select an item, delete it, or add a subitem. Click the add value button to add a list of values. The values are added in a sequential hierarchical structure. The last value added appears in the Value and Display Value fields. To edit the value, manually type the desired value in the Value and Display Value fields. Select Append child item from the Static values drop-down list to append a value at the level currently selected, and create a new value as the child of the selected value. The following image shows an example. Note the number of the value. Select Insert before from the Static values drop-down list to insert a value before the selected value, as shown in the following example. Note the number of the value. Select Insert after from the Static values drop-down list to insert a value after the selected value, as shown in the following example. Note the number of the value. Optionally, click the Delete button to eliminate any values. The following image shows the Properties and settings dialog box and the Static data type options for a tree control. Check the Selected check box to show the entry in the Value field as the default value. 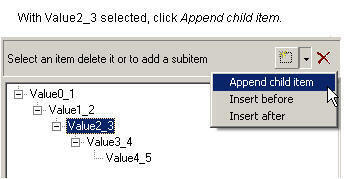 Check the Send display value check box to send the display value, rather than the actual data, to the parameter. Save and run the page to populate the tree control with static values. When a report contains one or more new amper variable parameters created in Report Painter, the New Parameters dialog box appears when you save the report and return to HTML Composer. You can assign a new Single source or Multi source Tree control from the HTML page to the parameter from the New Parameters dialog box. For each parameter, you will find Name and Control Type fields, a Create control check box, and options to set the Control Type to a Single source or Multi source Tree control. From the Design tab of HTML Composer, import or create a report that contains a parameter. When importing a report with parameters, the New Parameters dialog box appears prompting you to create the control type. Select the new tree control from the New Parameters dialog box. The following image shows the ST parameters with Single source Tree control being selected as the new control type for the parameter. The Control Type column refreshes, showing the selected control. The report is added and the associated parameters are bound to the tree control, as shown on the Parameters tab. As for any other type of input control, you can edit the Properties and settings, chain controls, change the control type, and so on. The following usage notes apply when chaining tree controls. 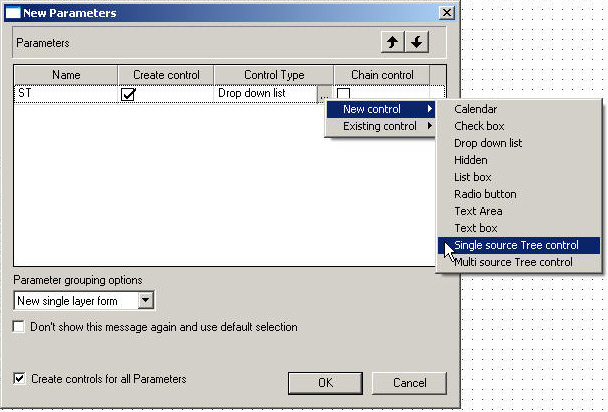 You may chain controls from the New Parameters dialog box and from the Parameters tab. 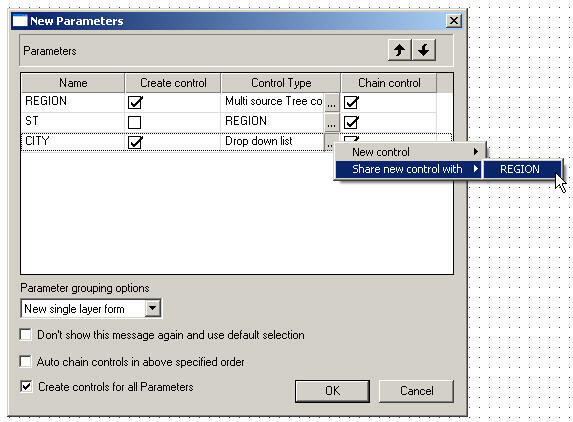 When the Multi source Tree control is a link in the chain, the New Parameters dialog box enables you to share parameters with the same multi source control. 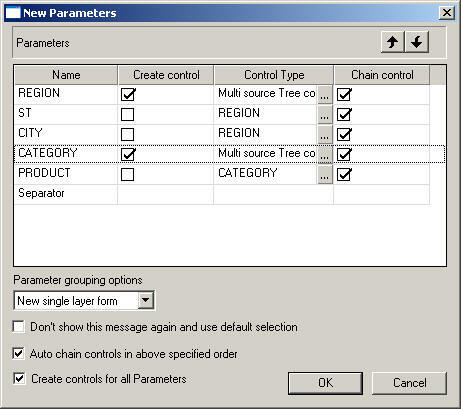 For example, the following image shows the New Parameters dialog box that appears when the first link in the chain, REGION, is a Multi source Tree control. 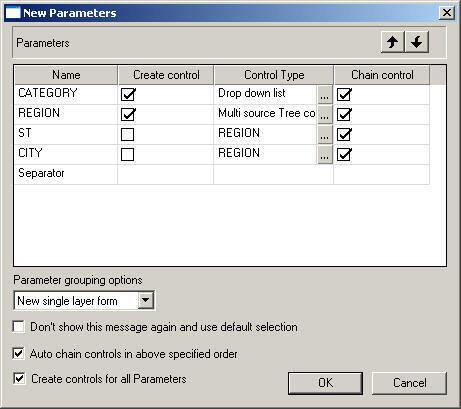 When the Chain control column is checked for the parameters, the remaining parameters, ST and CITY, can share the tree control with the REGION parameter. Note that when parameters are shared with the Multi source Tree control, the Create control column is unselected. The result of sharing the new control with a Multi source Tree control appears as follows from the Parameters tab. Note how the tree control shows multiple layers, chaining REGION, ST, and CITY. You can chain a Multi source Tree control to a Single source Tree control. For example, the following image shows the first layer of the Multi source Tree control populated with Account_Type from Account Properties of the Microsoft Analysis Services sample file, Adventure_Works. The second layer is populated with Accounts. The Multi source Tree is chained to the Single source Tree which is populated with Account_Number from Account Properties of the Adventure_Works data file. You can chain a Single source Tree control to another Single source Tree control. 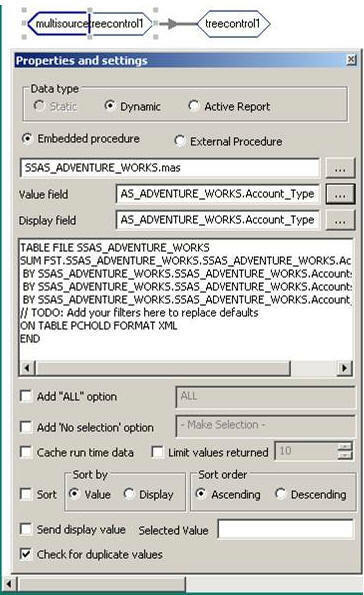 For example, the following image shows an example of a Single source Tree control populated with sample data from the Microsoft Analysis Services Adventure Works sample file, Adventure_Works. Treecontrol1 is populated with Accounts Member Caption and treecontrol2 is populated with Account Type. You can chain a Multi source Tree control to another Multi source Tree control. For example, the following image shows the New Parameters dialog box that shows two Multi source Tree controls. The first tree control contains REGION, ST, and CITY. Note that when parameters are shared with the Multi source Tree control, the Create control column is unselected. The second tree control contains CATEGORY and PRODUCT. The Chain control column is selected for all parameters, indicating that all the controls will be chained. The result appears as follows from the Parameters tab. Note the first tree control, treecontrol1, is a Multi source Tree control with three layers, containing REGION, ST, and CITY. The second tree control, treecontrol2, is a Multi source Tree control containing two layers, CATEGORY and PRODUCT. Treecontrol1 is chained to treecontrol2. You can chain a tree control to another non-tree control, such as Drop down list or List box. For example, the following image shows the New Parameters dialog box that shows a drop-down list and a Multi source Tree control. The drop-down list contains the CATEGORY parameter. The Multi source Tree control contains the REGION, ST, and CITY parameters. Note that when parameters are shared with the Multi source Tree control, the Create control column is unselected. The Chain control column is selected for all parameters, indicating that all the controls will be chained. The result appears as follows from the Parameters tab. The drop-down list, combobox1, contains the CATEGORY parameters. 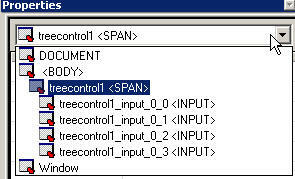 treecontrol1 is a Multi source Tree control with three layers, containing REGION, ST, and CITY. Combobox1 is chained to treecontrol1. Chaining cannot be done with only field names. Dynamic population of controls with field names need to use SYSCOLUMN calls. You may add a slider control for numeric range values in a report or graph. This enables you to use a slider bar to select from a range of values. Note: When using a Slider control in a RIA page, you can drag the slider to any value. For example, if a slider control is populated using a field whose only valid values are 2, 4, and 5, you can drag the slider to 1 and 3. From the Components toolbar, click the Slider button. Next, select the slider direction (Horizontal or Vertical), then select the slider type (Simple, Color Bar and Arrows or Color Bar, Arrows Edit). From the Insert menu, select Controls, then select Slider. Next, select the slider direction (Horizontal or Vertical), then select the slider type (Simple, Color Bar and Arrows or Color Bar, Arrows Edit). Drag the crosshair to create a slider control, and adjust it to the size you want. A slider control is created in the layout and assigned the name slider(n), where n is a number. Note: The slider control is determined by the default slider control type selected from the HTML Page tab, located in the Developer Studio Options dialog box. For details about changing the slider bar, see How to Change the Default Slider Bar. Optionally, change the slider control properties by adjusting the properties displayed in the Properties tab of the Properties window. For details, see Slider Control Properties in the Properties Window. Bind an existing parameter to the slider control. Binding a parameter to a slider control creates an incoming parameter. An incoming parameter is a parameter that is bound to a control. The parameter value will populate the slider control with values. Close this dialog since you are populating the slider control with a parameter value. Select the center of the parameter name object, left-click and drag the parameter to the center of the slider control object, and release the mouse to complete the binding. To unbind the parameter from the slider control, select the arrow head on the line, so that the line is bold, right-click, and select Break binding. Bind the slider control to a parameter. Binding the slider control to a parameter will populate the parameter with a range of values. Create the range of values for the slider control. You can create a list of Static or Dynamic range of values. Note: If creating a Static Data type for the slider control, enter the minimum and maximum values for the range in the Minimum and Maximum input fields. The Step input field indicates how the numbers increment on the slider bar. Close the Properties and settings dialog box to create the slider control with the range of values. Bind the slider control to a parameter. Select the center of the slider control, left-click and drag the slider control to the center of the parameter object, and release the mouse to complete the binding. Run the HTML page and use the slider bar to slide the values up or down. You may also use the end arrows to increase or decrease the numbers in the range. The output is generated based on the selected number from the slider bar. The default slider type is determined from the HTML Page tab, located in the Developer Studio Options dialog box. To change the default slider type, select Options from the Window menu. The Developer Studio Options dialog box opens. Click the Form Settings button to open the Form Settings dialog box. When a slider control is selected, the Properties tab in the Properties window contains options that control the properties of the slider control. Date parameters can utilize a built-in calendar control that enables you to select the desired date or range of dates in a pop-up dynamic calendar. A procedure that is added to or referenced in HTML Composer and contains date parameters will have a Calendar control type available in the Properties tab of the Properties window. When the Calendar control type is selected, a text box with a calendar icon will display in the Design view of the layout. The text box is the only control available for the calendar, and the icon will always display to the right of the text box. The icon cannot be positioned independently from the text box. Note that when programmatically returning a date to the calendar, the date must be in a FOCUS date format that specifies the complete date from the list of supported data types in Calendar Properties. Click the Calendar button from the Components toolbar. From the Insert menu, select Controls, then click Calendar. Drag the crosshair to create a calendar and adjust it to the size you want. A calendar placeholder is created in the layout and assigned the name calendar(n), where n is a number. Optionally, change the calendar properties by adjusting the properties displayed in the Properties tab of the Properties window. For details, see Calendar Properties in the Properties Window. Bind an existing parameter to the calendar. Binding a parameter to a calendar creates an incoming parameter. An incoming parameter is a parameter that is bound to a control. If binding a parameter to a calendar, the parameter value must be in a FOCUS date format that specifies the complete date from the list of supported data types in Calendar Properties. The parameter value will populate the calendar with date values. Close this dialog since you are populating the calendar with a parameter value. Select the center of the parameter name object, left-click and drag the parameter to the center of the calendar object, and release the mouse to complete the binding. To unbind the parameter from the calendar, select the arrow head on the line, so that the line is bold, right-click, and select Break binding. Bind the calendar to a parameter. Binding the calendar to a parameter will populate the parameter with a date value. The Properties and settings dialog box opens, showing the calendar setup options. The calendar setup options enable you to set the range of dates available to the user at run time. Available dates will be represented as an active hyperlink (blue and underlined) and unavailable dates will be static (black without underlines). Note: The Properties and settings dialog box for a calendar will contain different options depending on the selected data type. Create the values for the calendar. You can create Static or Dynamic values. When the Current/Start date option is checked, the current date will be used in the calendar control at run time. Static. This option will set a static date range in which the developer will select a start date and an end date using a pop-up calendar icon, or by clicking the month, day, or year from the controls. The pop-up calendar icon appears in the From and To sections when the Static Date Range is selected. If you click the pop-up calendar icon, a pop-up calendar appears and shows the current date selected and circled in red by default. As you scroll through the calendar with the left/right arrows, the currently selected day will remain highlighted for each month. Clicking a date will add that date to the control. Dates can be selected by scrolling left to right, entering the month, day, and year as text, or by selecting the month, day, and year from the drop-down list and spin boxes. Relative. This option allows you to set a specific number of days, months, and years relative to the current date. The current date (at run time) will always be the reference or starting point and the calendar will show a number of days, months, and years relative to the current date. The range could be all in the past (for example, five years prior to the current date) or all in the future (for example, five years in the future). This is selected as the default Date Range. Dynamic. This option allows you to point to a procedure that returns a range of dates. Clicking the Select custom procedure browse (...) button allows the developer to choose a preexisting procedure located in the current APP (local projects/data server) or Domain (MR). The procedure must return two date values on the same data line in XML format. The date values must be returned in a format that returns two digits for the month and day, and four digits for the year, for example, MM/DD/YY. For an example of returning a range of dates from a procedure, please see the example shown later in this section. Close the Properties and settings dialog box to create the calendar with the range of date values. Bind the calendar to a parameter. Select the center of the calendar, left-click and drag the calendar to the center of the parameter object, and release the mouse to complete the binding. The date format can be displayed differently by selecting one of the available formats from the Date format in data source drop-down list in the calendar controls Property and settings dialog box. The format you select must match the format in the data source or the virtual field, if that is the date field you are using. By default, it will match the format in the data source. Note: When using a format that is missing a component (such as the day in the MY format), the missing component will be taken from the current days date. When a calendar is selected in HTML Composer, the Properties tab in the Properties window contains the properties of the selected calendar. The following returns the complete range of date values for HIREDATE. -* This extracts minimum and maximum to a single record. -* This reads that record twice to create two extract files with each field having the same name. -*This uses MORE to create two records. <col colnum="c0" fieldname="NEWDATE" alias="E01" datatype="date"
A hidden input control allows parameter values to be used in a control without the user seeing them. When a hidden control is used, the current input control assigned to the parameter will not be visible. The value of the parameter can be entered in the Properties and settings dialog box of the Parameters tab, or supplied through chaining. Click the Hidden control button from the Components toolbar. From the Insert menu, select Controls, then click Hidden. Drag the crosshair to create a hidden control and adjust it to the size you want. A hidden control is created and assigned the name inputhidden(n), where n is a number. A hidden control is not visible in the Design view of your layout. It is available as a control object on the Parameters tab. Optionally, change the hidden control properties by adjusting the properties displayed in the Properties tab of the Properties window. Select inputhiddenn from the Properties drop-down list. The Properties window contains a hierarchical drop-down list of objects that are currently in the layout. Bind the hidden control to a parameter. Binding the hidden control to a parameter will hide the parameter value when you run the HTML page. Create the list of values for the hidden control. You can create a Static or Dynamic value. Note: If you are not seeing the value, you should set the list to evaluate to one value. Close the Properties and settings dialog box to create the hidden control with the list of values. Bind the hidden control to a parameter. Select the center of the hidden control, left-click and drag the hidden control to the center of the parameter object, and release the mouse to complete the binding. Select the input control on the Parameters tab. Right-click and select Hidden from the Set Control Type context menu. The input control is hidden on the control in the Design view and when you run the HTML page. Select the hidden control object from the Parameters tab. Right-click and select the desired control from the Set Control Type context menu. Tip: You may have to reposition the input control on the Design tab of the layout when changing control types. When you manually add a new parameter on the Parameters tab, you may pass the parameter variable to a hyperlink action. The additional parameters appear on the Hyperlink Properties dialog box when you create a new action. The Hyperlink Properties dialog box is available when you create a Hyperlink, Push button, Frame, Image, and Submit button. Note: When using Google Chrome™ and when a hyperlink action causes a report to be run in a new window, the report will run in a new tab instead of a new window. Optionally, you may use the Format field to define the format of the parameter, such as A20 or D12.2. These are static parameter options. To bind the new parameter to a control, select the Design view and create an input control. For example, insert a list box, drop-down list box, and so on. Select the center of the parameter name object, left-click, and drag the parameter to the center of the control object. This makes it an incoming parameter that will populate the control. If the control will populate the parameter, select the center of the control object, left-click and drag the control object to the center of the parameter object. The following image is an example of an incoming parameter. To modify the parameter value, right-click the parameter on the Parameters tab and select Properties and settings. Tip: You may also use the Undo and Redo buttons located on the Standard toolbar. Note that undo/redo treats the entire Properties and settings dialog as one action. From the Design view, create and open the Hyperlink Properties dialog box for the input control to create the hyperlink action. For example, insert and right-click the Push Button object and select Create hyperlink. The Hyperlink Properties dialog box opens for the selected object. Click the New button to create a new action. The Additional parameters button appears on the Hyperlink Properties dialog box. The Additional parameters button only appears if parameters were created from the Parameters tab of HTML Composer. Select the Action, Source, Target Type, and Target/Template Name for the hyperlink. Click the Additional parameters button and select the parameter name(s) to pass in this hyperlink. If you are linking hyperlink properties to another page or procedure, HTML Composer parses the other file for unresolved parameters and opens the New Parameters dialog box. When you run the report and click the hyperlink, the action passes the parameter value to the entity specified in the Source column of the Hyperlink Properties dialog box. You may bind a button, hyperlink, or image to a control on the Parameters tab in HTML Composer. This enables you to dynamically repopulate the control with new values at run time by clicking the button, hyperlink, or image. 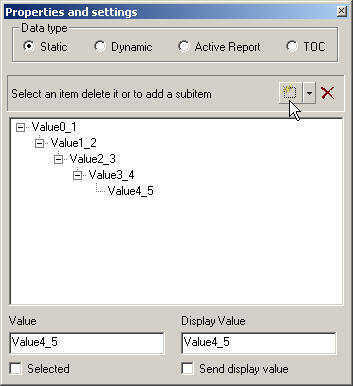 For example, the following image shows a report with a custom list of static values for the State field in a list box control. Clicking the button repopulates the list box control with a dynamic list of state values, enabling you to select a state and run the report. 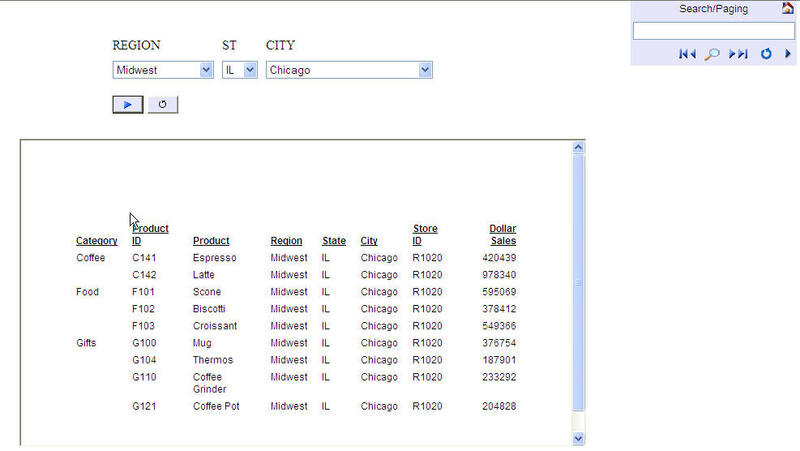 Using information from the sample data source GGSALES, create a report with a state parameter. A list box control shows a custom list of selected state values that you have created. A push button, bound to the list box, repopulates the control and shows a dynamic list of state values from the data source at run time. This enables you to selectively populate the list box with static or dynamic values before running the report. Select the HTML Files folder from your project in Developer Studio. Type binding_button in the File name text box and click Open. Drag the crosshair to create a reporting object and adjust it to the size you want. Select By from the Columns toolbar. Insert your cursor after the City field in the Report Painter canvas, and select Sum from the Columns toolbar. Create a parameter for the ST field. This parameter will be populated from a static list when you initially run the report on the HTML page. Type By State in the Prompt field. Keep the default Static list from the Accept List section. California, CA, Georgia, GA, Illinois, IL, New York, NY. Select List box from the Control Type ellipsis button and click OK to automatically add the state parameter control to the HTML page. Insert a button, hyperlink, or image object. Adding a button, hyperlink, or image to the layout enables you to execute a request at run time. For this example, insert a push button. Optionally, you may rename the text of the button by typing text in the Value property field in the Properties window. Add the button object to the Parameters tab. The Properties and settings dialog box opens, showing a Legend of the available controls for the values on the HTML page. From the Thumbnails tab, select the button object. Left-click and drag the object onto the Parameters tab. Release the mouse to move the object onto the Parameters tab. The button object appears on the Parameters tab and the Properties and settings for the button appear. Bind the button object to the list box control. Binding the button, hyperlink, or image to a control enables you to populate the control with alternative code. Select the center of the button object, left-click and drag the object to the center of the list box control object, and release the mouse to complete the binding. A line indicates the direction of the bind. Create the properties and settings for the bound object. Click the arrow head in the link of the chain between the button and list box control. The Properties and settings dialog box enables you to create alternative code to populate the list box at run time. Create dynamic values for the state parameter. Keep the default Embedded procedure selected. Click the browse button and double-click ggsales.mas from the Get source file dialog box. From the Value field, click the browse button and double-click ST. 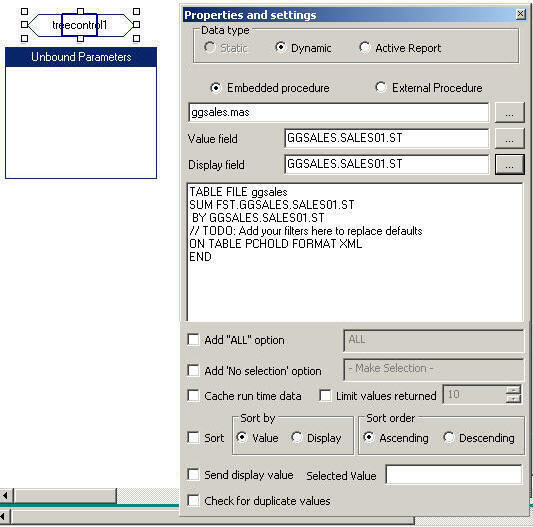 The GGSALES data source is added as the Value and Display field, as shown in the following image. Using the default list of static state fields, run the report. Click the push button to repopulate the list box with the dynamic state values from the GGSALES data source. Note how the list of state values changed. Select a state value from the list box and run the report. Tip: Click the Refresh button to repopulate the list box with the default static values. In this procedure, you will create multiple list box controls that will all have parameters bound to them. When the appropriate combination of these four parameters is selected, the fifth list box control will be populated with the related information. Create a procedure, using the car Master File, named countrycars.fex. Insert two COUNTRY fields, Sum FST.COUNTRY BY COUNTRY. This ensures that you get each value of country one time and in sorted order. Create selection tests comparing CAR to &Parameter1, MODEL to &Parameter2, DEALER_COST to &Parameter3, and RETAIL_COST to &Parameter4. Set the output format for this procedure to XML. Create a new HTML file named cars.htm. In the HTML file, create a new, Single Layer Form. Delete the Submit Form button, as shown in the following image. Create four list boxes inside the form and one list box outside the form, as shown in the following image. In the Properties and Settings dialog box, change Selection Required to Yes for all four list boxes inside the frame. Insert labels for each list box. Name the four inside the form, Parameter1, Parameter2, Parameter3, and Parameter4. Name the list box on the outside Result. Add four parameters to the file, as shown in the following image. Bind listbox1 to Parameter1, listbox2 to Parameter2, listbox3 to Parameter3, and listbox4 to Parameter4, as shown in the following image. Bind listbox1, listbox2, listbox3, and listbox4 to listbox5, as shown in the following image. Edit the properties of listbox1, listbox2, listbox3, and listbox4. Select the Dynamic Data type option for all four list boxes. 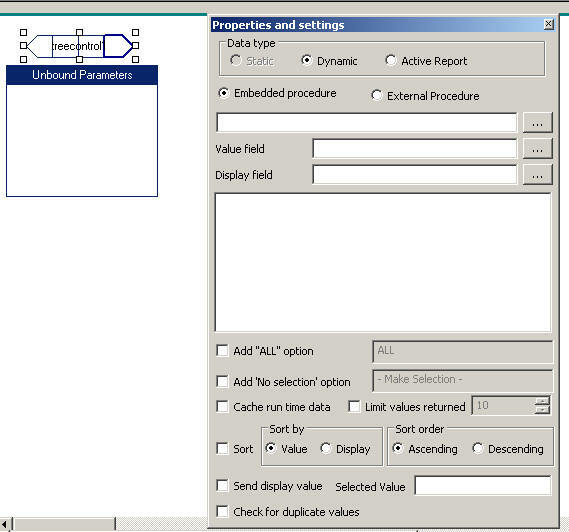 Select Embedded procedure for all four list boxes. Click the procedure ellipsis button (...) and select car.mas for all four list boxes. Set the Value field for listbox1 to CAR; for listbox2, MODEL; for listbox3, DEALER_COST; and for listbox4, RETAIL_COST. Edit the properties of listbox5. Select the Dynamic Data type option. Click the procedure ellipsis button (...) and select countrycars.fex. If it is not set already, set the Value field for listbox5 to COUNTRY. Edit the binding properties for each of the bindings between listbox1, listbox2, listbox3, and listbox4 to listbox5. Click the procedure ellipsis button (...) and select countrycars.fex for all four bindings. The Value field and Display field are assigned the COUNTRY field upon the selection of the procedure. Change Resolves Parameter to the appropriate parameter for that list box. For example, listbox1 is bound to Parameter1. Therefore, you should select Parameter1 for the Resolves Parameter field. Save and run the report. A new web browser window opens with four populated list boxes and one empty list box. For Parameter1, select ALFA ROMEO. For Parameter2, select 2000 4 DOOR BERLINA. For Parameter3, select 4,915. And for Parameter4, select 5,925. Listbox5 is populated with the value, ITALY, as shown in the following image. Note: Only when the appropriate combination of values are selected does the result display. If you were to choose 5,610 for Parameter4, no result would be displayed.